To Cite: Solanki S L, Goyal V K. Neuraxial Dexmedetomidine: Wonder Drug or Simply Harmful, Anesth Pain Med. 2015 ; 5(2):e22651. doi: 10.5812/aapm.22651. In current anesthesia practice, neuraxial anesthesia is a major method among all anesthesia modalities. The most frequently performed neuraxial blocks are consecutively subarachnoid, epidural, and caudal blocks. Major indications are intraoperative anesthesia and analgesia, postoperative analgesia, analgesia for vaginal delivery, and management of chronic pain. For these purpose, local anesthetics (LA) are widely used alone or in combination with adjuvants. Adjuvants are mixed with LA to shorten the onset of action, increase the quality of block, increase the duration of anesthesia and analgesia, and to decrease the dose of LA. Benzodiazepines (e.g. midazolam), opioids (e.g. morphine, fentanyl, and sufentanil), α-adrenergic agonists (e.g. epinephrine or phenylephrine), ketamine, and ∝2-adrenergic receptor agonists (e.g. clonidine or dexmedetomidine [DEX]) are adjuvants of common use. Mechanisms of action are also different. Out of these, ∝2-adrenergic receptor agonists are relatively newer and their uses are increasing. 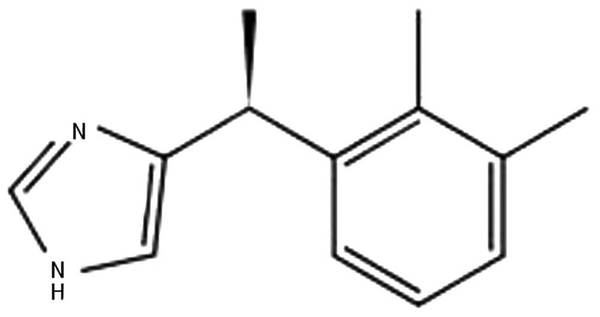 DEX, a dextrorotatory S-enantiomer of medetomidine, is an ∝2-adrenergic receptor agonist with the chemical structure being (S)-4-[1-(2, 3-dimethylphenyl) ethyl]-3H-Imidazole (Figure 1). Effects are usually dose dependent. Until now, there is no specific recommended dose of DEX for this purpose. Dose can be varied from 3 to 15 µg as an adjuvant to LA in spinal anesthesia. Solanki et al. stated that in comparison to clonidine (50 µg), equipotent dose of intrathecal DEX (5 µg) significantly prolonged postoperative analgesia (10). When compared to other adjuvants (fentanyl, magnesium sulfate, or buprenorphine), DEX showed prolonged postoperative analgesia with delayed and decreased need of rescue analgesics (11-13). For caudal epidural block, 1 to 2 µg/kg of DEX along with bupivacaine led to prolonged analgesia without significant side effects (14, 15). Moreover, use of epidural DEX significantly decreases the anesthetic requirements, prevents awareness during anesthesia, and improves intraoperative oxygenation and postoperative analgesia (16, 17). DEX along with LA for epidural analgesia during labor pains shows good maternal satisfaction without deleterious effect on uteroplacental circulation and newborns outcome (18). In a review and meta-analysis of perineural DEX, Abdallah et al. (19) showed an association between intrathecal or epidural DEX, as adjuvant to LA, and onset and duration of sensory and motor blockade; moreover, the time to first analgesic request was prolonged. They also mentioned that these results might be due to publication bias because of the source studies may or may not reflect less stringent Institutional Review Board and/or editorial board policies. DEX has also been used as an adjuvant in peripheral nerve blocks and has shown to prolong the sensory and motor block duration (20). The most common reported adverse effects are bradycardia and hypotension. Bradycardia due to DEX is resistant to atropine and higher doses are needed; although rare, even cardiac arrest might occur. Reported fatal complications of DEX were mainly related to its intravenous use as infusion in the elderly and in patients with cardiac disease (21, 22). Hypotension is due to decrease in central sympathetic outflow. When a large dose of DEX is used, it is preceded by hypertensive episode due to stimulation of α-2B receptors. Klinger et al. (23) in a retrospective analysis of 15656 patients concluded that there was no significant difference in the overall incidence of intraoperative hypotension (5.3% in DEX group, 6% in control group) or bradycardia (0.4% in both groups); however phenylephrine or atropine were more required in DEX group (23% vs. 15%; P < 0.0001). DEX should not be used as a sole anesthetic for neuraxial anesthesia. Konakci et al. (24), in their study on rabbits, observed that when epidural DEX was administered without LA, it would induce neurotoxicity (evidence of demyelination of the oligodendrocytes in the white matter in DEX group) in doses as high as 6.1 µg/kg. None of the human randomized studies have used DEX doses > 0.2 µg/kg for spinal adjuvant and > 1 µg/kg for epidural adjuvant. In addition, intrathecal DEX has shown a neuroprotective effect similar to methylprednisolone (25, 26), and no long-term and irreversible harmful effect of neuraxial DEX has been reported yet. In conclusion, DEX is a good LA adjuvant that can hasten the onset and prolong the duration of sensory and motor blockade when used in intrathecal or epidural block and appears to be safe; however, there are insufficient safety data to support the use of neuraxial DEX in the clinical setting.